At the start of every theme, all classes take part in something called an ‘Excite’, which is normally a trip, visitor or an exciting lesson/activity to engage the pupils. For example, in Year 4 this half term the children visited the Sea life Centre as part of their Blue Abyss theme. They got to go behind the scenes as VIP guests and see how the animals are fed and how the staff maintained the tanks. One thing the children were especially excited about was being able to hold a fossil of a Megaladon’s tooth. This was then followed up with a series of lessons/activities, which resulted in the children creating their own ‘Ocean Gallery’ where we were invited to view their hard work. Year 5 also had an exciting start to their theme when they visited the Leicester Space Centre. Children got to conduct a variety of Science experiments; they particularly enjoyed looking at rock samples to identify if there were any life-forms or if there were any meteorite fragments. They also got to visit the planetarium, where they immersed themselves in space and looked at the different constellations. Children used this information and their hard work over the half term to produce a Space exhibition. In addition to our Nurture and SEAL sessions we have been working with a local company called ‘LittleThink’ to deliver mindfulness and positive thinking sessions to our Key Stage 2 children. This half term we have also conducted sessions with our Nursery children as part of ‘Tinythink’. Mindfulness is a great way to manage emotions and stress and LittleThink use mindfulness techniques that are specifically tailored to children, teaching them fun ways they can practice mindfulness both at school and at home. The children have worked incredibly hard at home to complete their E3L themed homework projects. 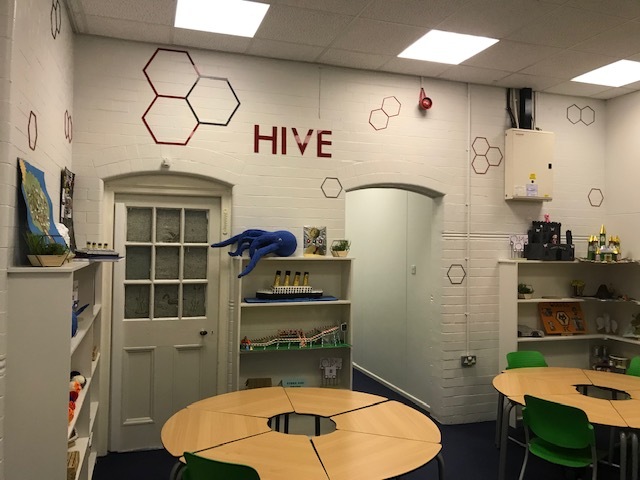 To showcase their work, we have built a gallery called the Homework Hive. Look out for the new list of activities before the half-term break; we look forward to seeing all of the new projects when we return. This half term children have learned how to stay safe, attending e-safety workshops which focused on how to stay safe online as well as the hidden dangers of apps. The school also ran DECCA (Drug Educational, Counselling and Confidential Advice) presentations, which help the younger children understand what is safe to eat/drink; the older children learned about the dangers of substance misuse. We also now have a whole school ‘worry box’, based in the main reception, which gives children the opportunity to say if they are unhappy or need help – this is checked regularly by Mrs Durnall. As a school we have introduced new strategies for reading, one of which is implementing a set of new books for your children to enjoy. All of the books link to their themed work so the children can immerse themselves in what they are learning. In addition, school council have also worked hard to create a book review club in the library to encourage children to read more at home. The school council will present their ideas to the senior leadership team after the holiday to share what went well. Mixing romance with reading, to celebrate Valentine’s Day, the children took part in ‘Blind Date With a Book’ to find the book of their dreams. A selection of books were wrapped up with a message for its new reader. If they liked the sound of the message, they could unwrap and find out how brilliant the books were! We hope you have a lovely February half term and look forward to seeing you on Tuesday 26th February.